Time charter rates in the smaller chemical tanker vessel sizes are expected to remain stable over the next two years, but rates for the larger sizes, especially Medium Range tankers (MRs), will decline due to the impact of falling freight rates for clean petroleum products (CPP), shipping consultancy Drewry said. Weakened chemical tanker freight rates in the second quarter of 2016 have resulted in softer time charter rates. Despite a modest improvement in the CPP market expected in the next two quarters, the chemical tanker freight rates would remain weak in the third quarter with a pick up in the fourth quarter of this year. Drewry said that the rates would be mainly influenced by a reduction in demand from China as plants shut down from end-August to early September for the G20 summit. The chemical tanker fleet grew at a Compound Annual Growth Rate (CAGR) of 4.2% from 2010 to 2015, and is expected to grow at a slower rate of 3.5% annually from 2015 to 2020. However, the fleet growth will slow from 2018 as new orders have already started to moderate, according to Drewry. A total of 114 ships with over 4 million dwt were delivered in the first half of 2016. The number of deliveries in 2016 will exceed those of each year since 2010, and the entire fleet is getting younger with an average age of 9.8 years. “We expect freight rates and time charter rates for coated MR chemical tankers to continue to drop over the next few years. 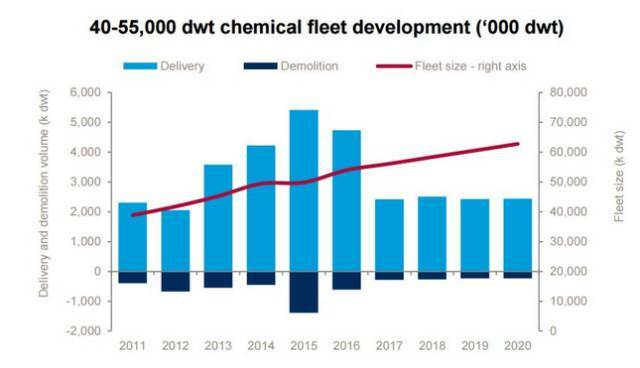 For anyone contemplating investment in shipping, MR chemical tankers could be one of the most unattractive sectors today,” Hu Qing, Drewry’s Lead Analyst for Chemical Shipping, said.